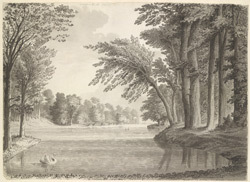 Sanderson Miller and Tilleman Bobart designed the gardens at Wroxton between 1720 and 1748. The lake featured an impressive cascade, a bridge and was overlooked by a circular temple. Sadly, not many of these features remain and the park and 17th-century house now belong to an American university.